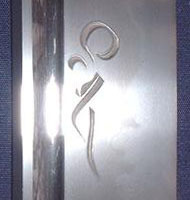 Usually it suggests the sword of the buddha "Fudo-myo'o". Sometimes it can mean any buddha. It is not a decoration, but is the most simple symbol of prayers. So it must appear on one side. It means a seat of Buddha. It doesn't appear as it only. It must be a set for a Sanskrit letter. 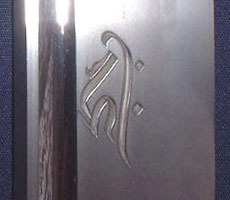 Sometimes this buddha appears on the blade as a set of Sanskrit letter and a short groove, both on one side or separate onto each side. 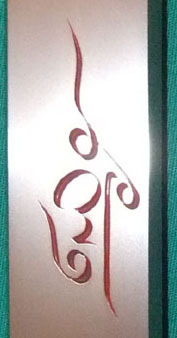 A Sanskrit letter of Fudo-myo'o like Shintogo style. 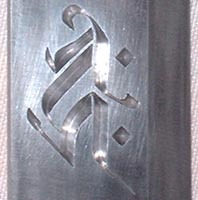 On the obverse side, a Sanskrit letter of Bishamonten. 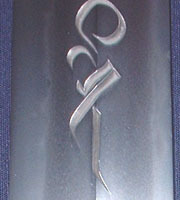 On the reverse side, a short groove with a narrow longer groove beside it. It suggests a figure of Bishamonten who stands with a long halberd. 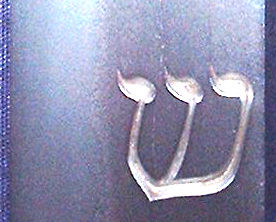 Hebraic letters are not found in old Japanese swords. This is made by request of a customer. 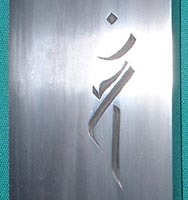 We think, the spirit to put it into the blade accords with the tradition of Japanese sword.